If you are new here I should tell you up front that I am a huge fan of LEGO. If you have been around a while, you know this about me and have seen the many LEGO articles we have available on the site. LEGO is a wonderful toy, though I kind of hate to even call it a toy, for it is so much more. It is a pathway to making anything you can imagine, it is an art medium, it is a tool that people are using to design incredible things like Braille machines, it is used to make movies, and it is an engaging way for kids to learn while they play. LEGO Learning is something I have been focusing on lately. I was thinking about what boys learn from playing with LEGO. You will be amazed at how many things we came up with! My brother used to spend long hours in the hallway playing LEGO while my mom sewed. I am sure he learned a lot while playing. He has a very mathematical mind and I think building and creating with bricks was a natural way for him to use that strength. Like my brother, my son has loved to build since he was very young. The drawback of being young and using tiny bricks is that it is super frustrating. They are tough for little fingers to put together and get apart (my fingers hurt after taking apart so many pieces—really hurt!) plus LEGO falls apart. If you push a bit too hard, it can collapse. All of these things were great for him though. He learned, he dealt with frustration, he had to make adjustments to how he built or ask for help. It was a wonderful experience for a young boy. Here are more things learned by playing with LEGO bricks. LEGO gets kids using their imaginations. You can use it to create sculptures, mosaics, stamped paintings, and collages. Builders use patterns and symmetry. Additional construction techniques are picked up as they build. Engineering comes into play when trying to make different structures. Work is done in 2D or 3D. As building skills progress you may work with scale such as Microscale, Minifig Scale or Life-size. Following specific step-by-step directions including visual direction following. LEGO learning is very natural. They play . . . they learn. Fine motor skills are used during building. The learning is hands-on and some boys really need this type of learning. Perseverance! LEGO can be very frustrating and boys can get very easily frustrated with it. But because of its appeal they tend to stick to it. Problem Solving. There are a lot of opportunities for figuring out how to make things work. Can help special needs children learn as it tends to hold their attention when other things won’t. Communication skills are used when storytelling with Minifigs, when explaining what they made or in working with others. The greatest thing about LEGO, my absolute hands-down favorite thing of all, is that LEGO can be turned into absolutely anything you can build–anything! LEGO is the best toy/tool/learning resource we have in our home. Ok, we do have quite a bit of LEGO but . . . just the other day my son and I were building some LEGO Designs and we looked at each other and said “We need more bricks!” and we were not kidding. I think I will be ordering this. I love these classic sets they came out with. They have great pieces in them–they even come with eyes! With all those bricks around you might want to check out this article on choosing the best way to keep all of the items organized. 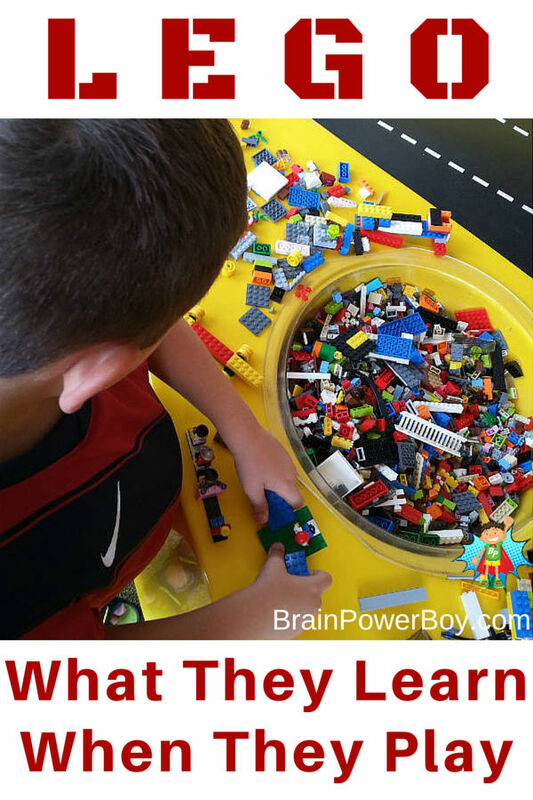 See our big awesome LEGO page for other fun articles and resources. If you get a moment can you click on a share button below? I’d appreciate it! Thank you for this! My son works with his Lego bricks non stop. If there is a free moment in the day he is playing. I know he gets a lot from it, but it is nice to hear someone else say it too! Pinning! I have been thinking about getting some Lego’s for my niece. All of things you listed are just as important for girls to learn as well. I’m a little worried she is to young for them though. What age did you first give your son legos? Thanks for stopping by. Yes, of course all of the things I listed are important for girls as well 🙂 My site is about boys’ learning so the focus is on boys. As to your question regarding LEGO . . . my son was very young when we gave him LEGO. Every child is different and a lot depends on their developmental skills as well as if they still put things in their mouths. I would suggest going to this link (affiliate) http://bit.ly/1If22ke and clicking on “Age Range.” That will give you sets that are recommended for certain ages. You are one hundred percent right. I am seeing this with my two boys. I too love Legos, except the time my kids leave a big clutter out of it. We love lego in our house too! My son rotates between lego and trains. I also have been looking at that classic set. I think the classic sets allow for some more open ended play. Oh yes, trains are super popular too 🙂 I do like the classic set. We got two of them and are really happy with the selection of pieces in them. Lego’s are such a great tool for learning! My kids find them irresistible! We have always had Legos in our home too, starting with the Duplos when the kids were very little. It never occurred to me how much more the kids were getting out of their Lego play time other than fine motor skills and creativity though! Love this list. Thank you for linking it up at This Is How We Roll Thursday. I hope you come back and share more of your posts. We love them! Thanks for the nice comment Corinne. You made my day. It really is amazing how much they learn! We seem to be going back through a ‘putting small things in mouth’ phase in our house – but when we’re done I think I’ll introduce some lego play. I loved building towns with lego when I was a kid! Oops, totally best to wait then. We love Lego’s at our house. Even our 2 year old gets in on the action. I’m sure she does. You and your family take LEGO to a new level. I love how you encourage your kid’s passions.